My laboratory is developing self-assembling DNA nanostructures and devices for use in biomedical applications. Our group previously solved a key challenge for nanotechnology: programmable self-assembly of complex, three-dimensional nanostructures. Our solution was to build custom three-dimensional structures that can be conceived as stacks of nearly flat layers of DNA. The lecture will discuss applications of this technology for molecular biophysics illustrated by its use to make weak-alignment media for NMR structure determination of membrane proteins; to build 3-D scaffolds for determining the number of “SNARE” complexes necessary to fuse lipid-bilayers, and to study how the shape and size of DNA nanoparticles affects their rates of cellular internalization. The lecture will further discuss applications of the technology for medical therapeutics. 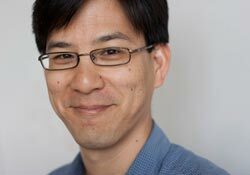 WILLIAM SHIH holds joint appointments as Associate Professor in the Department of Biological Chemistry and Molecular Pharmacology at Harvard Medical School and in the Department of Cancer Biology at the Dana-Farber Cancer Institute. He is also a Core Faculty member at the Wyss Institute for Biologically Inspired Engineering at Harvard. He earned an A.B in Biochemical Sciences from Harvard University and a PhD in Biochemistry from Stanford University. After postdoctoral work at the Scripps Research Institute he joined the Harvard faculty. Among other awards, he has received a New Innovator Award from the National Institutes of Health.